Not without a bit of self-interest, Netflix recently published a “study” on viewers’ habits. 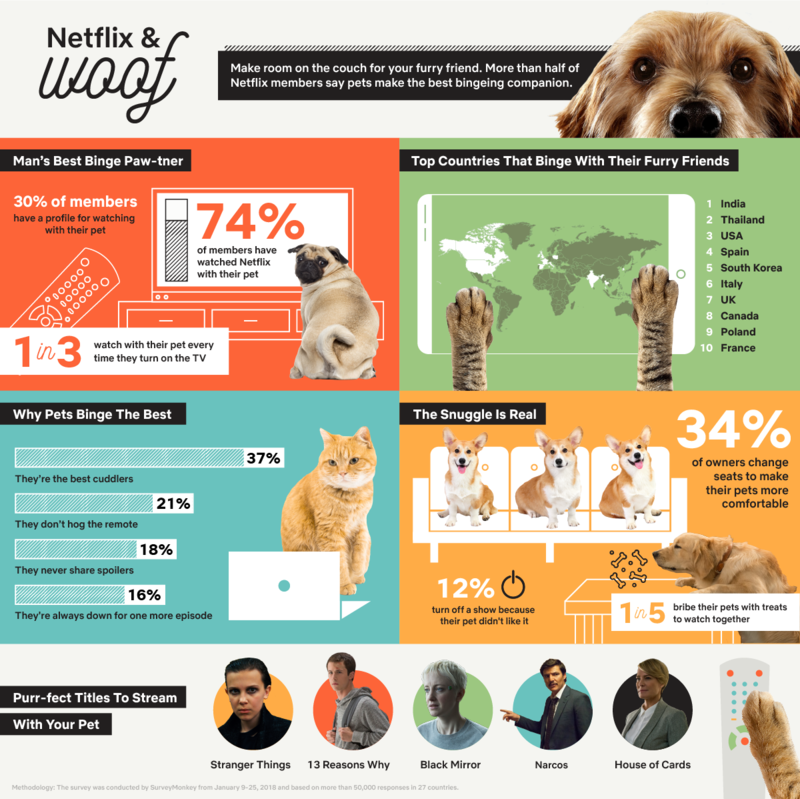 Not surprisingly, many people prefer watching Netflix with their pets to watching with other humans. Pets rarely hog the remote, they don’t give away the plotline, and they always let you choose the program. Pets might gobble all the binge snacks, but you still get to decide what and how much junk food to serve. Some respondents change the show if their pets don’t seem to be enjoying it, so maybe I am wrong (or just selfish) about always getting to choose. Cali does prefer shows that have dogs in them, as long as the dogs seem happy. I’m with her on changing the channel if the dog gets hurt. She’s willing to indulge my Grey’s Anatomy addiction, though, and we both like the British baking show. She likes nature shows too. Many viewers reconfigure their seating arrangements to accommodate their pets’ comfort, which is pretty much the story of my entire life, in front of the TV or not. Bird owners are the most attentive to their friends’ wishes, with more of them reporting that they choose shows specifically based on their pets’ preferences. I’m wondering whether that’s true of all bird owners or only those whose birds talk. Netflix does not say. The saddest statistic is the 20 percent (!) who have to bribe their pets to watch with them … they must have really horrendous taste in TV or really uncomfortable couches. But I do relate to the 22 percent who talk to their pets about what they’re watching. As well as the one-in-three who “turn to” their pets for comfort during scary parts. If by “turn to” you mean “bury your face in the fur of,” that is!